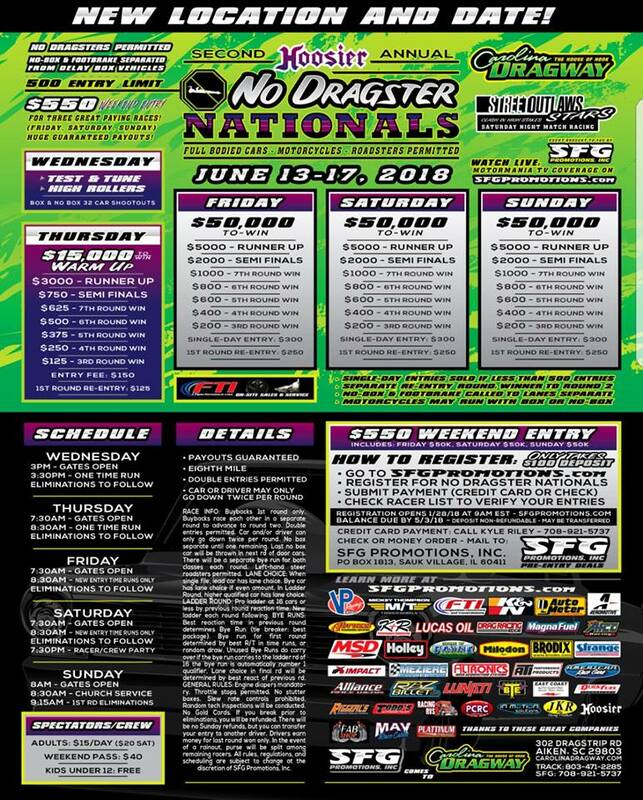 Jackson, SC - Live Coverage from the SFG Promotions No Dragster Nationals goes live Thursday morning and continues thru the weekend at Carolina Dragway in Jackson, South Carolina. 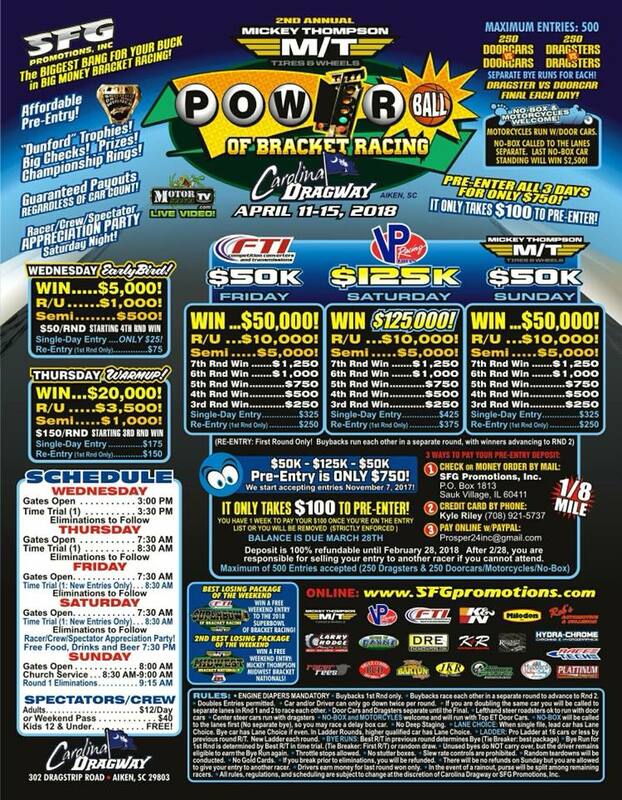 Jackson, SC - The 2nd Annual Power Ball of Bracket Racing kicks off at Carolina Dragway in Jackson, SC on Wednesday Afternoon around 3 p.m. and runs through Sunday. $125,000 to Win Guaranteed Main Event on Saturday. Click Here for Live Video and Chat of all the weekend's Big Bucks Racing Action. 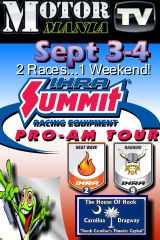 Jackson, SC - Live Coverage begins Friday Morning of the Final IHRA Pro Am at Carolina Dragway in Jackson, SC. Racing action continues throughout the weekend with coverage provided by MMTV. CLICK HERE for Live Video Coverage. Aiken, SC - Top Bulb $20,000 to Win Big Bucks action this Saturday with a $10,000 Sunday race. 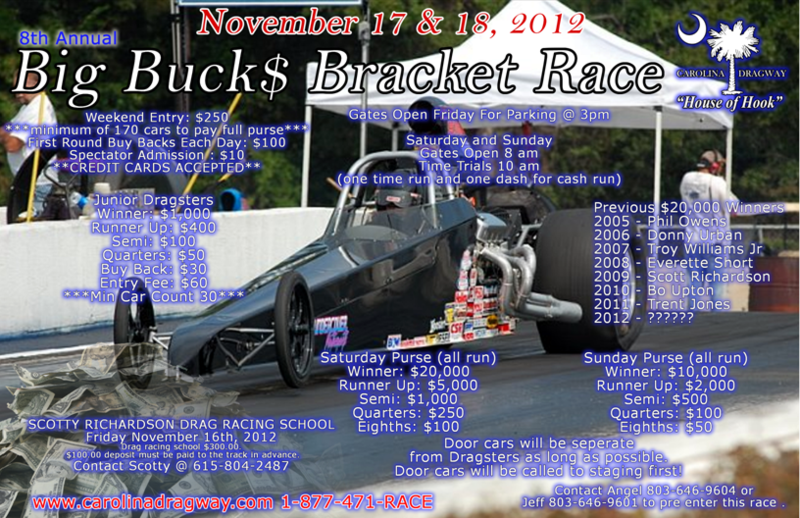 JR's will also be contested for a $1k to Win on Sat. and Sun. Gates Open 3pm on Friday for parking. Click Here for Race Flyer. 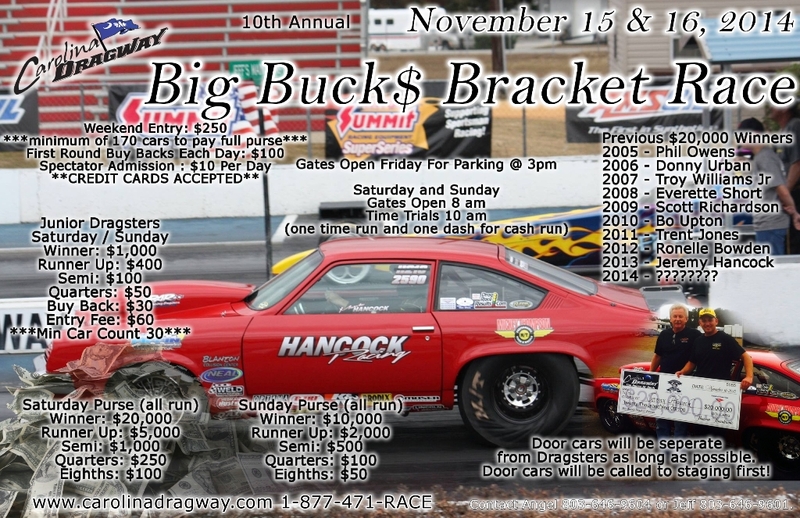 Jackson, SC - November 17th and 18th Carolina Dragway in Jackson, SC will be hosting their Big Bucks Race which pays $20,000 to win on Saturday and $10,000 to win on Sunday in Electronics. A $1,000 to win Jr race will also be contested. Jackson, SC - Saturday Purse is $20,000 to win based on 170 cars. 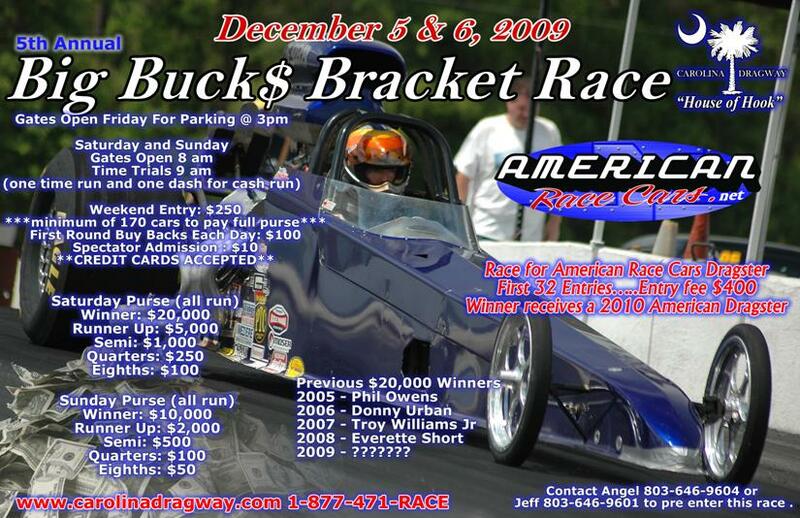 American Race Cars 32 car Dragster Shootout - Flyer Attached. 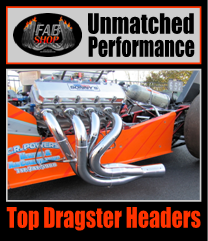 Jackson, SC - M & M Motorsports and Speedtech Nitrous Systems, the largest growing nitrous company on the market today and sponsor of the Awesome Motorsports Pro Modified team, are proud to announce a partneship for the 2005 season in Hooters IHRA Top Dragster competition.